Everyone can take the #RecognizeYourStars Challenge! Post a photo or video, tag #RecognizeYourStars and we'll donate $5/photo and $15/video to the Nik Zoricic Foundation. Help us reach $10,000 goal! TORONTO, ON, March 01, 2018 /24-7PressRelease/ -- Ten amazing Canadian Olympic athletes and counting have taken the #RecognizeYourStars Challenge in support of the Nik Zoricic Foundation. Phil Brown, Erin Mielzynski, Marie-Michele Gagnon, Gilmore Junio, Dave Dunlop, Brittany Phelan, Kris Mahler, Jake Holden and others have thanked the people in their lives who help them achieve their dreams and power through the tough days. View their expressions of thanks here. CSI STARS and Team Canada Alpine Skier Phil Brown challenge everyone to #RecognizeYourStars. 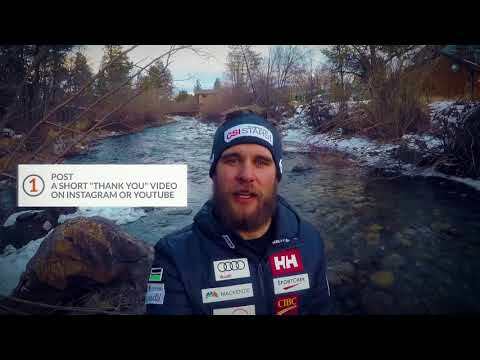 Simply post a short thank you note or video to Instagram or Facebook. Tag with #RecognizeYourStars and CSI STARS along with Project X Ltd will donate $5/photo and $15/video to the Nik Zoricic Foundation's ski racing safety programs. Nik Zoricic was a Canadian World Cup skier who lost his life during a ski accident five years ago. The Foundation was established to improve ski racing safety across the country and help tomorrow's stars achieve their dreams. Take the #RecognizeYourStars Challenge today! CSI STARS recognition, safety, wellness and performance programs meet the unique needs of our clients and their multi-generational workforce. Like a successful athlete, CSI STARS programs are lean and agile. For more information on CSI STARS recognition and reward solutions, contact Jim Brown at jim.brown@csistars.com or request a short demo. Project X Ltd. handles data, analytics, systems integration and support. Using an integrated delivery model and Rapid Results methodology, clients see results in a quick and cost effective manner. For more information on Project X solutions, contact Stephen Hayward at shayward@pxltd.ca. The Nik Zoricic (NZ) Foundation strives to minimize constraints faced by skier athletes on their quest for success. It aims to minimize risk of serious accidents and injury due to lack of safe training and unsafe conditions through safety equipment grants and net and padding loan programs. NZ also supports the growth of skiing through funds for needing and deserving athletes and by providing training camps and other unique development opportunities. The Foundation supports the continuous advocacy of the importance and implementation of safety initiatives in sport and helps athletes achieve long-term success by providing education on the opportunities available to athletes through sport. For more information contact info@nzfoundation.ca. Join these amazing athletes in helping us improve safety in ski racing by taking the #RecognizeYourStars Challenge supporting the Nik Zoricic Foundation. Join Erin and other athletes as they take the #RecognizeYourStars Challenge to raise money for a great cause!